The Homan Square Community Center at 3517 West Arthington is a comprehensive recreation, health, family and education center for the residents of the North Lawndale community and Chicago's West Side. The Center, opened in January of 2002, is a public-private initiative of the City of Chicago, the Chicago Park District, the Homan Square Community Center Foundation, The Shaw Company and five non-profit service providers. 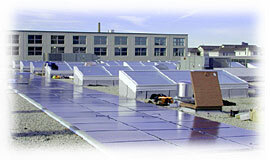 In addition to the installation of solar-electric panels on the roof, the facility was constructed using energy-efficient technologies. The site also includes more than 4-acres of green and open space. The Community Center is part of the Homan Square community redevelopment on the site of the original Sears, Roebuck and Co. headquarters. In addition to the Center, the award-winning redevelopment effort includes 142 single-family, duplex, or town home units and 158 rental units, along with one million square feet of commercial space in partially renovated buildings. For more information on Homan Square, visit homansquare.org or call 773-265-4404.